With six Democratic candidates for County Executive and over thirty Democrats running for Council At-Large, the hunt is on for MoCo primary voters. Luckily for the candidates, we are here to point the way! Let’s start by looking at population. Residents are not distributed evenly across the county. The neighborhoods closest to the D.C. border and close to urban centers are more dense than Upcounty areas. Below we show population estimates by local area for the years 2012-2016 from the U.S. Census Bureau. Local areas are grouped by zip codes. For example, data for Rockville does not refer to the municipality itself, but to the four zip codes that comprise Rockville (20850, 20851, 20852 and 20853). Because Silver Spring is such a large part of the county, we broke it into four pieces: Downtown (zip codes 20901 and 20910), Wheaton (20902), Glenmont/Norbeck (20906) and Silver Spring East County (20903, 20904 and 20905). And so the population concentrations are where one might expect: Downcounty and near urban centers like Rockville and Gaithersburg. But that’s not the end of the story. Our elections are decided by closed Democratic primaries. For state legislative and county offices, the general elections have not been relevant since 2006, when the last two Republican elected officials (County Council Member Howie Denis and Delegate Jean Cryor) were defeated. And Democrats are distributed differently around the county than all residents. Right after the last cycle ended, we obtained a January 2015 version of the voter file from the county’s Board of Elections and spliced it with Census data to model local elections. The number of registered Democrats in MoCo has risen by 5% in the last three years so, for the purpose of looking at geographic patterns, our existing voter model is not exact but is not too far off. Below is a comparison of population by local area from 2012-2016 and the number of registered Democrats from January 2015. There are large differences in Democratic density (the percentage of residents who are registered Democrats) between MoCo’s local areas. 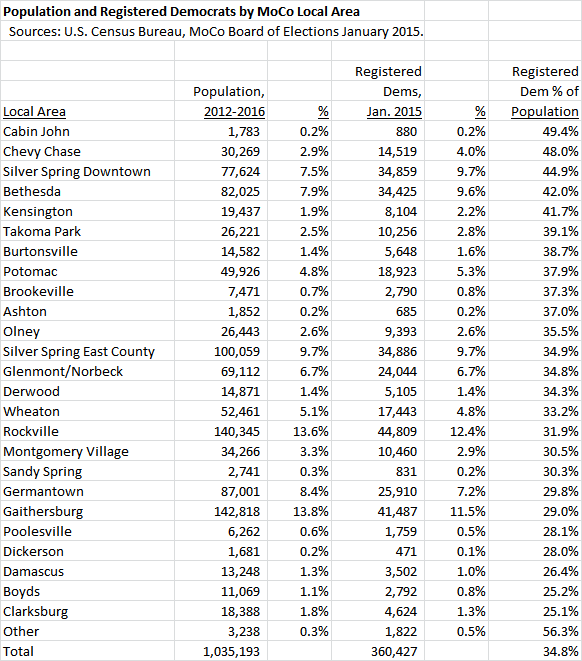 In five local areas – Cabin John, Chevy Chase, Kensington, Bethesda and Silver Spring Downtown – more than 40% of residents are registered Democrats. And in seven local areas – Dickerson, Poolesville, Damascus, Germantown, Gaithersburg, Boyds and Clarksburg – less than 30% of residents are registered Democrats. Now let’s fine-tune this even further. The chart below compares population by local area from 2012-2016 to the number of Super Democrats, whom we define as having voted in all three of the 2006, 2010 and 2014 primaries, in January 2015. This Super Dem number has probably fallen slightly as a few folks who voted in those primaries have left the county or passed away, but the broad pattern will still hold. Again, there are large differences in Super Democrat density (the percentage of residents who are Super Dems) between local areas. 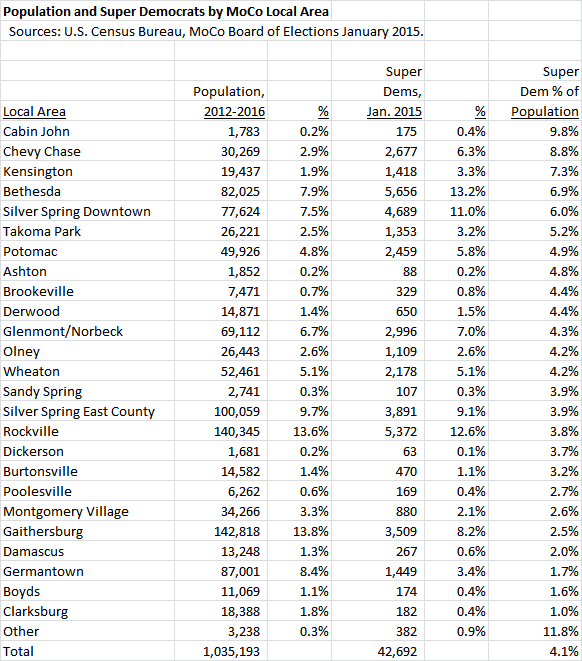 In six areas – Cabin John, Chevy Chase, Kensington, Bethesda, Silver Spring Downtown and Takoma Park – at least 5% of residents are Super Dems. 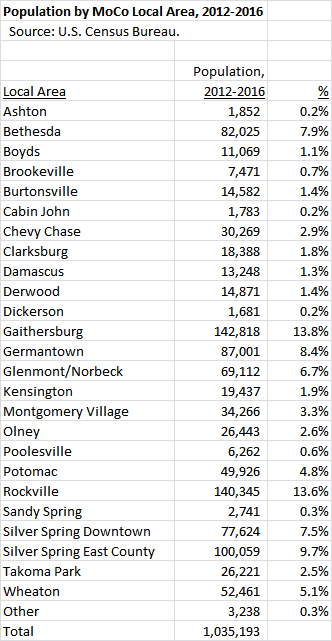 In seven areas – Poolesville, Montgomery Village, Gaithersburg, Damascus, Germantown, Boyds and Clarksburg – less than 3% of residents are Super Dems. Here’s the bottom line – countywide elections are decided in large part by voters in a Democratic Crescent stretching from Takoma Park in the east through Downtown Silver Spring, Kensington and Chevy Chase to Bethesda and Cabin John in the west. These areas roughly trace the neighborhoods around the Beltway and between the Beltway and D.C. They are the parts of the county that sent Jamie Raskin to Congress. Together, the six areas in the Democratic Crescent have 23% of the county’s population, 29% of the registered Democrats and 37% of the Super Dems. Every countywide candidate is going to want to play there. Does that mean that a candidate whose chief appeal is outside the Democratic Crescent is doomed to fail? Not necessarily. Crescent voters have MANY suitors as most of the Executive and Council At-Large candidates come from those areas and will be aggressively pursuing votes there. Council Member Nancy Floreen, who is a former Mayor and current resident of Garrett Park, won four straight at-large elections by combining women, moderates and Upcounty voters and her 2014 second-place finish was her best ever. This model is no doubt being studied by County Executive candidate and former Mayor of Rockville Rose Krasnow and Council At-Large candidate and Germantown resident Marilyn Balcombe, both of whom Floreen has endorsed. One more thing. Some Upcounty activists have long complained of the influence of Downcounty on county government decision making. Your author did not witness geographic parochialism on the part of any At-Large Council Members, all of whom come from Downcounty, during the time I was employed at the council. But to the extent that Downcounty does exercise disproportionate influence, it’s because those residents turn out in Democratic primaries to a much greater extent than people who live Upcounty. As long as primaries remain closed to party members, that will continue to be the case in any countywide elections regardless of structural changes in county government. If you are an Upcounty resident and you don’t like that, the best remedy is to get your neighbors to vote in the primary. Downcounty’s influence is only likely to grow because of one new factor in county politics: the implementation of public financing. As we shall see, a large percentage of contributions to publicly financed candidates is coming from localities in the Democratic Crescent we described above. That information will be published in the near future. Stay tuned to Seventh State!